Hi Everyone! 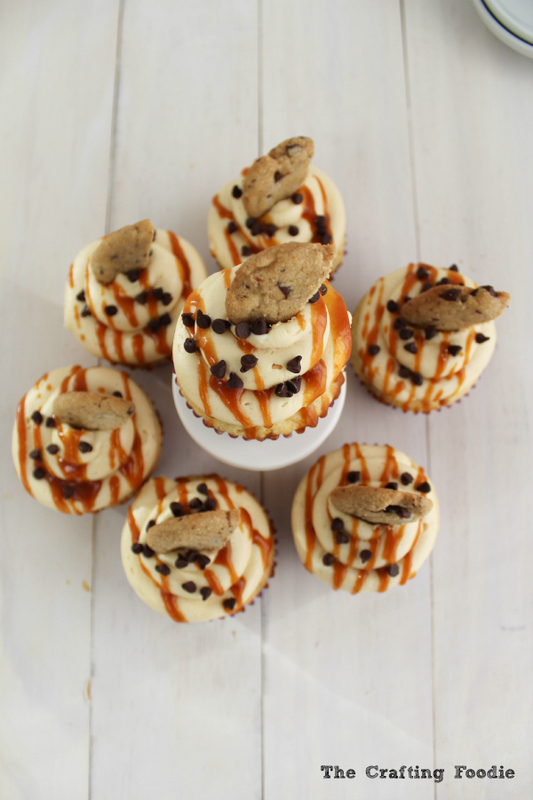 I’m Aida from The Crafting Foodie, and I’m so excited to be sharing these Brown Butter Chocolate Chip Cupcakes with you today. A few months ago I made this Brown Butter Banana Toffee Cake. It was my first time baking with brown butter, and let’s just say it was revolutionary. Simply cooking melted butter until it turns golden brown, brings out the nuttiest, deepest flavor in already-delicious butter. Not being able to shake my addiction to brown butter, a few weeks ago a made these Brown Butter Chocolate Caramel Cookies. They lasted a whole three hours before they were devoured. 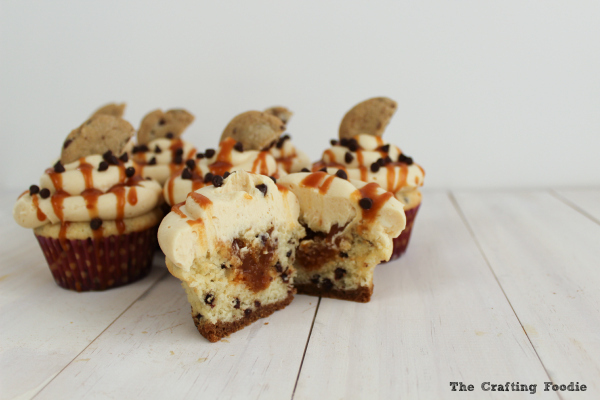 Today I’ve created these Brown Butter Chocolate Chip Cupcakes. The base of the cupcake is a fluffy, moist brown butter cake with mini-chocolate chips. To add a little texture to the cupcake, I baked a brown butter chocolate chip cookie as the crust of the cupcake, and I filled the cupcake with some homemade salted caramel. Trying not to overshadow the amazingness of brown butter, I kept the frosting simple. with a salted caramel frosting. Then I drizzled the cupcakes with some more salted caramel and sprinkled them with some mini-chocolate chips. 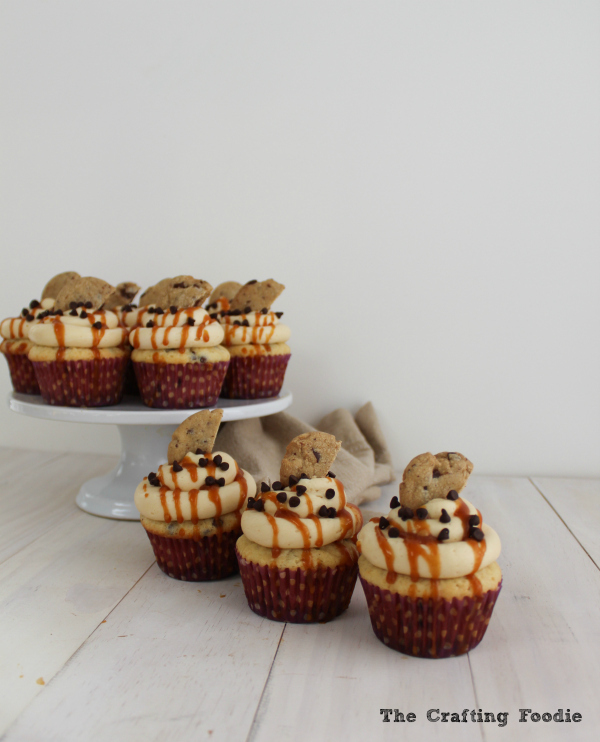 And for an extra special touch, I topped the cupcakes off with a small brown butter chocolate chip cookie. 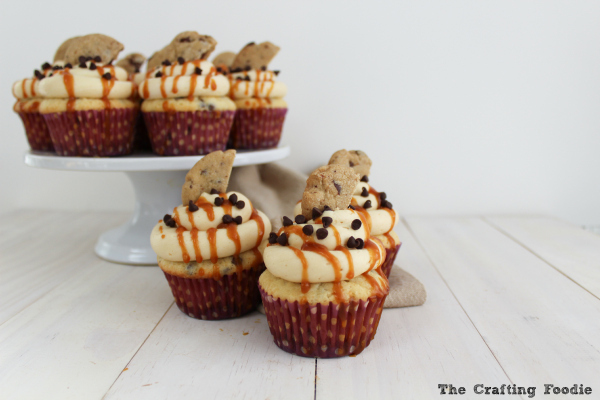 I hope these Brown Butter Chocolate Chip Cupcakes have inspired you to try brown butter. I promise that it’s worth the hype! If you’re looking for some more mouthwatering sweet treats, check out my blog, The Crafting Foodie. You can also follow me on Facebook, Google+, Pinterest, and Instagram. Take 8 tbs (or ½ cup) of butter and place it in a small, heavy bottomed sauce pan. Melt the butter over medium heat. After it melts and continues to cook, it will bubble and pop. Once the popping stops, start to swirl the pan. Continue to cook until the butter smells nutty and the milk solids (which will sink to the bottom) begin to turn a deep amber brown. It will take about 3 minutes. Remove the brown butter (along with the brown solid bits in the bottom of the pan) to a bowl. Allow it too cool for about 20 minutes. While the brown butter cools, make the rest of the cookie batter. In a medium bowl, sift the flour, salt, and baking soda. Set aside. In the bowl of a standing mixer fitted with a paddle attachment, beat the remaining butter with the brown sugar until it’s light and fluffy. Beat in the vanilla and molasses. Add the cooled brown butter and the granulated sugar. Beat for about 3 minutes until fluffy. Add the egg and egg yolk. Mix until just combined. Add the flour mixture. Beat at low speed until the ingredients are just combined. Mix in the chopped chocolate. While the dough chills, make the caramel. Allow the caramel to cool and thicken for a few hours. Line baking sheets with parchment paper or a silicon baking mat. Using about 1 tsp at a time, roll the dough out. Slightly flatten each dough ball before placing them in the oven. Remove the cookies from the oven, and allow them to sit on the baking sheet for about 5 minutes before placing them on a cooling rack to cool completely. Start by lining a standard 12-cup muffin tin with paper liners. Place about 1 ½ tsp of the reserved brown butter cookie dough in the bottom of each muffin tin. Press down dough to fill the bottom of the cupcake liners. Allow the cookie crust to cool while making the cupcakes. In a small sauce pan, melt the butter over medium heat. Continue to cook the butter until it begins to brown and turn golden. It will take about 4 to 5 minutes. Once the butter is browned, transfer the butter and the brown bits at the bottom to a bowl to cool. While the brown butter cools, whisk together the flour, baking powder and salt in a small bowl. In a large bowl, beat together the cooled brown butter and sugar until combined. Beat in the eggs, one at a time until combined. Add the flour mixture alternating with the milk in three batches, starting and ending with the dry ingredients. Fill the prepared muffin tin 2/3 full. Bake for about 20 to 25 minutes or until a toothpick inserted in the center of the cupcake comes out clean, with a few moist crumbs attached. While the cupcakes cool completely, make the salted caramel frosting. In the bowl of a standing mixer fitted with a paddle attachment, cream the butter until fluffy. Add the confectioner’s sugar. Beat until fluffy. Add the salt, vanilla, and milk. Mix until creamy. Remove the top, and fill each cupcake with about 1 tsp of salted caramel. Replace the top of the hole you cut with the cut out piece. Using a pastry bag fitted with a large round opening, pipe the frosting on the cake. While the frosting is still freshly piped, sprinkle with mini-chocolate chips. Fill a zip-top bag with the salted caramel. 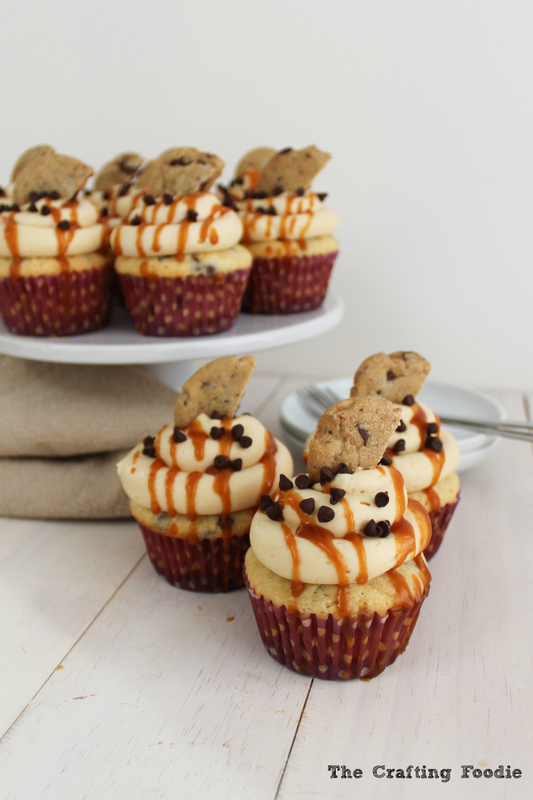 Drizzle the caramel over the cupcakes. 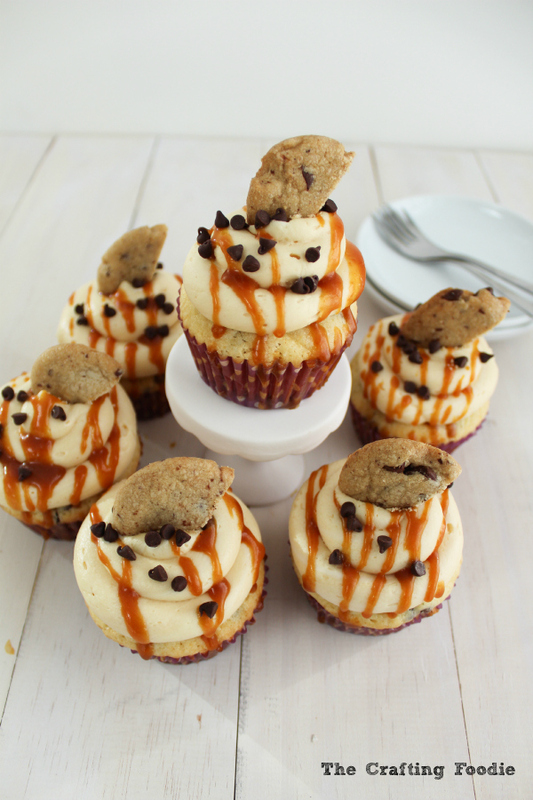 Top each cupcake with a brown butter chocolate chip cookie.